DelEx Air Cargo LLC is a global freight forwarding company, and a single source of all logistics and supply chain solutions for your business. DelEx Air Cargo is a family owned company established in 2000. We are a licensed Indirect Air Carrier and IATA member with office in JFK Int’l Airport (New York), in the heart of the air cargo industry, and SEA Int’l Airport (Seattle). 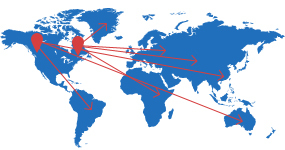 We have a large network of reliable partners throughout the world who deliver an outstanding service. DelEx employes ambitious, multicultural professionals who focus on fast, responsive and reliable customer service with the right attitude to a cost effective, dependable and competitive logistics solution. dedicated people who care about your money and time. around the globe. We are always here for you.